Chocolate bars, rolls of love hearts, party poppers, bubbles, ribbon, invitations - all of which can be personalised for your hen night celebrations. 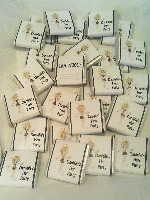 Ordering your personalised chocolate bars is easy. Once you have chosen your design select the size and type of bar you would like from the drop down menu. The price will be automatically adjusted depending upon your choice. Next please type in what personalisation you would like on the bar and the date you would like it for. 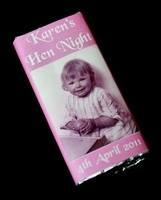 On most designs personalisation can be added to the front and back of the wrapper. Any queries please send an e-mail to info@itsawrapcornwall.co.uk or telephone 07727 630552 (voicemail available for a message if I'm not able to get to the phone). More wrapper designs coming soon.